088.Miriam Needoba – JavaMuseum 2010 – Celebrate! Miriam Needoba is an artist and filmmaker based in Nelson, British Columbia. Where “Mr. Potato Head” meets “Civilization”. Design-O-World is an interactive website that explores the myriad of possible interpretations to be gleaned from the simple manipulation of a seemingly objective and knowable image – a map of the world. “The map is not the territory” is a related expression meaning that an abstraction derived from something, or a reaction to it, is not the thing itself…” (Alfred Korzybski cited in Wikipedia). Once your masterpiece is finished and, if chosen, you have filled in the commentary box perhaps elaborating on the design choices in your world and where you live in this one, you save it to the Gallery page. 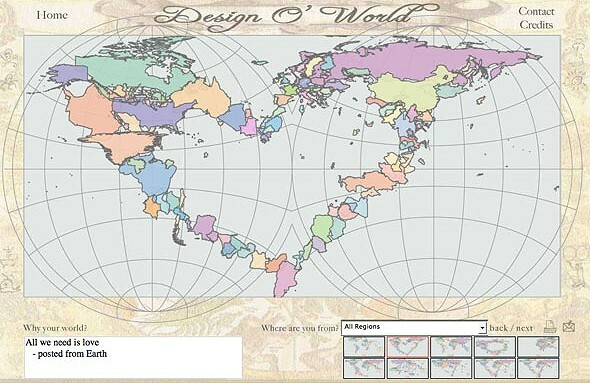 You can also print out your world or email it to yourself or a friend.